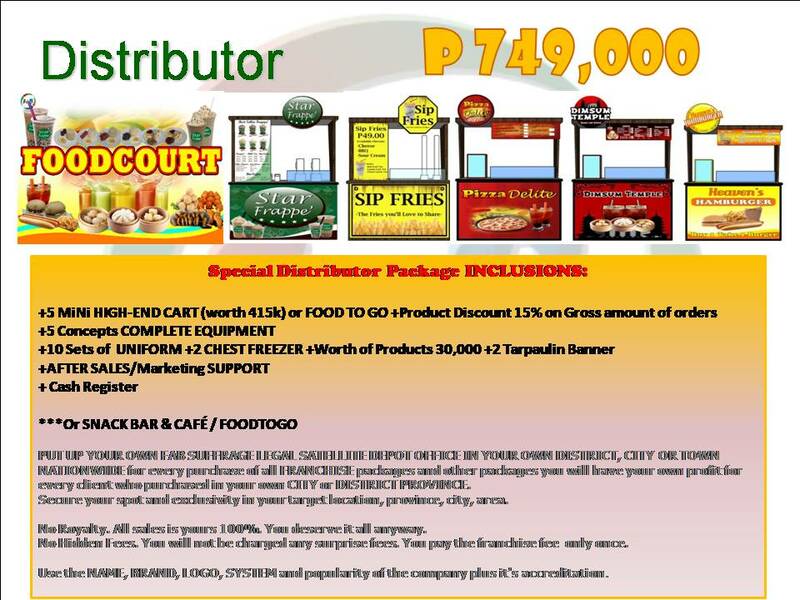 ﻿SPECIAL DISTRIBUTOR'S PACKAGE SPECIAL DISTRIBUTOR'S PACKAGE FOR ONLY P749,000 ! ! ! PUT UP YOUR OWN FAB SUFFRAGE LEGAL SATELLITE DEPOT OFFICE IN YOUR OWN DISTRICT, CITY OR TOWN NATIONWIDE for every purchase of all FRANCHISE packages and other packages you will have your own profit for every client who purchased in your own CITY or DISTRICT PROVINCE. Secure your spot and exclusivity in your target location, province, city, area. No Royalty. All sales is yours 100%. You deserve it all anyway. No Hidden Fees. You will not be charged any surprise fees. You pay the franchise fee only once. ( ON OTHER COMPANIES IF YOU WILL PUT UP A DEPOT, YOU NEED 1 MILLION PESOS ABOVE, WITH "FAB SUFFRAGE FRANCHISE" ITS ONLY P749,000 ). For every district , city or town. There must only be one FAB SUFFRAGE OFFICE.